Shoulder-launched weapons avoid the problem of recoil by directing all exhaust out of the rear of the launch tube. An American-Bulgarian team prepares to reload an RPG-7 with a fresh rocket. 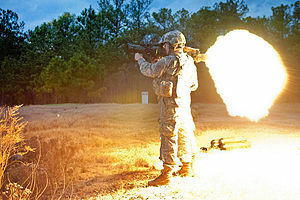 A shoulder-fired missile, shoulder-launched missile or man-portable missile is an explosive-carrying, self-propelled projectile fired at a target, while being small enough to be carried by a single person and fired while held on one's shoulder. The word "missile" in this context is used in its original broad sense which encompasses all guided missiles and unguided rockets. In many instances, although not technically defining all shoulder-fired missiles, the name bazooka is used as an informal name regularly, although the actual Bazooka is a type of shoulder-fired unguided rocket launcher in its own right. There are two kinds of shoulder-launched weapons. The first is the recoilless gun, which is essentially an open tube. When fired the reaction gases (with a momentum equal to the projectile) expelled out of the back of the weapon compensate the force exerted on the projectile. The other type is the rocket-propelled grenade; these typically also use a small recoilless charge or compressed gas system to get the projectile out of the barrel and to a distance where the operator will not be hurt by the rocket's backblast; when the rocket ignites at a safe distance, it further accelerates the projectile or at least keeps it from decelerating in its trajectory. Shoulder-launched weapons may be guided or unguided. Missiles can either have a disposable launcher (e.g. Panzerfaust, M72 LAW) or a reusable launcher (e.g. RPG-7). A JASDF soldier handles a Type 91 Kai MANPADS during exercises as a part of Red Flag – Alaska. Shoulder-launched weapons typically fire at one of two main target types — ground targets or air targets. Weapons for use against ground targets come in a wide variety of types and sizes, with smaller, unguided weapons generally used for close range combat and larger, guided systems for longer ranges. Most of these weapons are primarily designed for anti-tank warfare, although they are also effective against structures and a number of weapons have been designed specifically for such targets. Anti-aircraft weapons, known as man-portable air-defense systems (MANPADS), are small surface-to-air missiles. They are typically infrared homing weapons and used to target helicopters, UAVs and other low-flying fixed-wing aircraft. Rocket-based weapons have a long history, from the black powder fire arrows used by the ancient Chinese to the Congreve rocket referenced in "The Star-Spangled Banner," the national anthem of the United States. They have always been prized for the portability of their launch systems. The earliest rocket launchers documented in imperial China launched fire arrows with launchers constructed of wood, basketry, and bamboo tubes. The rocket launchers divided the fire arrows with frames meant to keep the arrows separated, and were capable of firing multiple arrow rockets at once. Textual evidence and illustrations of various early rocket launchers are found in the 11th century Southern Song Dynasty text Wujing Zongyao. The Wujing Zongyao describes a portable rocket arrow carrier consisting of a sling and a bamboo tube. Shoulder-launched rockets have a launch tube. In order to prevent the user from being burned by the exhaust, the rocket (or at least its first stage) must burn out before it leaves the tube, and if present the second stage must fire once the rocket is well clear of the launcher. Even if the operator is safe, there is a sizeable blast effect to their rear. Also, the rocket must have a reliable ignition system. In modern systems, this is almost always a percussion cap. This system was not fully developed until the German Panzerfaust of World War II, an early one-shot design that however also was the first practical recoilless antitank-gun and thus used no rocket. The Bazooka was an early rocket-propelled development which could be reloaded. 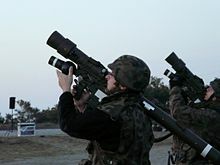 Polish soldiers prepare to fire PZR Grom MANPADS. From their first conception during the First World War, many portable missiles have been used to give infantry a weapon effective against armored vehicles and fortified structures. The power of the shaped charge meant that the effectiveness of the weapon was not limited by a gun barrel bore nor size of weapon as for example a conventional armor-piercing shell from an artillery piece. As such these man-portable weapons could be used to equip infantry units with their own anti-tank and anti-aircraft weapons. Shoulder-launched rockets or recoilless guns are a favored anti-technical weapon. They permit otherwise lightly or poorly armed troops (e.g. militias) to destroy modern sophisticated equipment such as close air-support aircraft, helicopters, and lightly armored vehicles. Attacks come from ambush for the element of surprise and attempt to immobilize a convoy of vehicles, then destroy its defenders, then destroy its contents, then escape before air or artillery support can arrive. Normally, the militia will plan to have two to four shooters per attacked vehicle. Reliable attack ranges are 50 to 100 m, although attacks can succeed out to 300 m. Self-destruct ranges of common rocket weapons such as RPG-7s are about 900 m.
The usual response to such attacks is to suppress the shooters, with saturation anti-personnel fire, artillery or aerial barrages in area-denial attacks. Submunition and thermobaric weapons are often used to clear landing zones (LZ) for helicopters. In modern counter-insurgency operations in misty, dusty or night-time situations, advanced optics such as infrared telescopes permit helicopter gunships to observe convoys from beyond human-visible range and still attack insurgents with inexpensive anti-personnel fire. This approach is more economical than area-denial. Protecting as little as 20% of the convoys rapidly depletes an area of active insurgents. PF-98 Anti-Tank Rocket Launcher "Queen Bee"
^ Joseph Needham (1974). Science and Civilisation in China: Military Technology The Gunpowder Epic. Cambridge University Press. p. 488. ISBN 978-0-521-30358-3.